Mary Maclaren Team Manager and myself Carol Gibbs Vice President would like to thank all of our team for their enthusiasm and tremendous team spirit the whole week. 85% of our total games going to the 17th or 18th, a few putts going our way and the results would have been different. Special mention to Charlotte Taylor our top points scorer and also a special mention to Thalia Martin one of our newbies for only losing one match all week. Special mention to our Team Captain Rosie Youngman for her leadership plus also a thank you to Miriam Johnson Team Manager for keeping us fed and watered on the course. To all of the players – you wear the County blue with pride and in spite of the overall result you always do the County proud. Thank you all for a great week. Keep up the good golf and we can come out on top next year. First Foursomes Rosie Youngman and Carol Gibbs who got off to a flying start 3 up after nine but after a few loose shots lost 5 holes in a row to be 2 down, won 17 but were unable to win 18th so lost 1 down. 3rd Thalia Martin who said she could not get the pace of the greens on the day Lost 6/5. The first pairing of the morning foursomes were Charlotte Taylor and Becky MacLaren, who despite playing well were unable to match the golf played by the opposition who lost on the 17 th , 2/1. Rachel Smith and Alex Banham were out second and after being 4 down early doors took the game down the 18 th but finished one down. Carol Gibbs and Thalia Martin got out the blocks early and went two up through two but tables had turned and they were two down through 11 but winning three holes on the spin got them back to 1 up and finished the game all square. Charlotte Taylor got the singles off to a great start went two up after two and was never down. With multiple birdies she finished strong and won 2/1. Second up was Alex Banham who had a tough game against an Irish International. Out third was young Ellie Darnell who went two up early doors and was never down, bringing home another point for Northants. Fourth out was Mary MacLaren, both players got off to a slow start but MacLaren had three birdie putts lip out while her opponent made a couple of birdies to clinch the match 2/1. Following closely behind was Rosie Youngman who played exceptionally well! Steady front nine but her opponent made birdies at 9 and 10. Rosie responded with a win at 11 and 16,17 saw the match go down 18 and the game was halved. Last out in the afternoon singles was Carol Gibbs, all square after 5 but her opponent made 5 birdies in the next 7 holes! The first pairing of the morning foursomes were Rosie Youngman and Becky MacLaren who battled hard for a half point with a brilliant birdie on the last. Next up were Carol Gibbs and Thalia Martin, a tried and tested pair who lost the first but after that were never down with long putts held by the pair throughout the entire match. A very solid match with a 2/1 win as a result. It wasn’t Ellie Darnell and Alex Banham day as the putts didn’t seem to be dropping for the pair, despite a passionate game and a well played front nine unfortunately Warwickshire got the point. The afternoon singles saw Mary MacLaren win 4&3 after two brilliant birdies on 14 and 15 after a solid game of great golf. Second up was Charlotte Taylor who was 3 down with 4 to play but following four birdies to finish managed to turn this around to win 1 up. Rachel Smith fought a tough battle with a well-seasoned player lots of great golf was played but unfortunately the point went to Warwickshire on the last. Fourth out was Thalia Martin who played a yo-yo game with lots of birdies and good golf to finish with a half on 18, still unbeaten on her rookie county week. The penultimate game was Becky MacLaren who fought a close match on the front nine but was unfortunate on the back nine leading to a point to Warwickshire. Rosie Youngman was out last and was unfortunate to be on the receiving end of adverse gamesmanship despite brilliant golf, unfortunately Warwickshire took this point. Rachel Smith and Mary MacLaren started off the morning foursomes but were hit with an onslaught of eagle, birdie, birdie within the first 4 holes to go down early on. They fought hard but were unable to gain the upper hand despite some very steady par golf. They eventually lost out 2/1 with good golf played by all 4 players. The 2nd game of Charlotte Taylor and Rebecca MacLaren was a display of great golf under pressure by both players, highlighted by Rebecca hitting a superb wedge on the 18th with their side being one down, gaining a win on the last hole to secure a halved match. 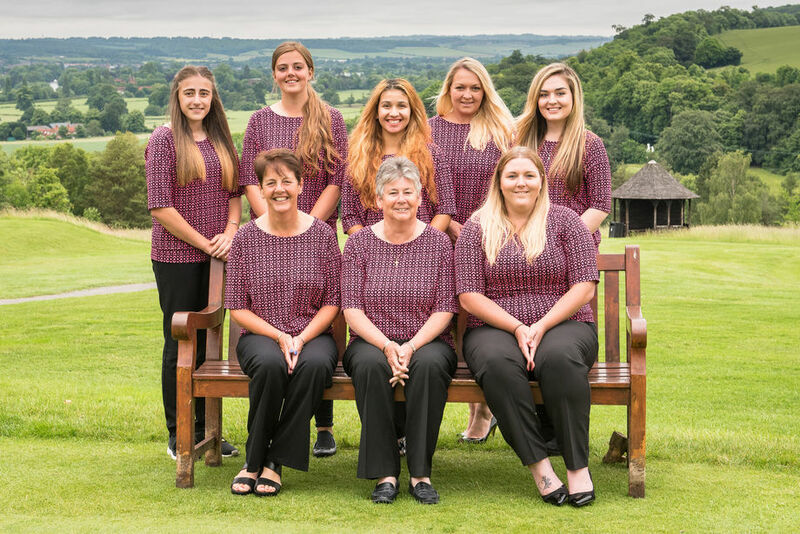 The final foursomes pairing of the debutante Thalia Martin and the experienced Carol Gibbs were a match made in heaven – very steady golf from both players gave the final group a 4/3 win; and thereby giving Northamptonshire a well earned halved morning session. The afternoon singles was led off by Alex Banham. Alex went down early to a series of birdies and sadly was unable to reclaim the advantage. Match no 2 was Rachel Smith who described her round as a ‘day-at- the-beach’ with rather too many bunkers coming into play and sadly another ‘nearly’ story as she lost 2/1. Ellie Darnell was out next and had the veritable game of two halves, sadly one half consisted of several ‘unmentionables’ and she eventually went down 2/1 to the former Irish Senior international Kate Evans. Next up was Mary MacLaren who got off to a great start winning 4 of the first 6 holes as her opponent struggled to find the green in regulation. But the Oxfordshire girl soon found her feet and gave Mary some pressure putts to hole. Mary held her nerve and finally came out a 2/1 victor. Rosie Youngman brought home a great penultimate match victory winning 4/3 with very steady par golf although she says she has a real problem with holes 9 and 12 and feels its hardly worth her playing these 2 as they are a total enigma to her. Last up was Charlotte Taylor who battled hard and came away with another half point; sadly though the team lost out 5-4 in another case of ‘nearly but not quite. The good news is we are moving in the right direction so fingers crossed for tomorrow. The Northamptonshire team woke to torrential rain hammering the hotel windows; upon arrival at the golf course it was clear to see that the rain was having an impact on the course. The morning foursome’s matches were suspended as the first pairing of Rosie Youngman and Carol Gibbs stood on the tee. The team was then told that the morning foursomes were to be entirely discarded and the six single matches would only count towards the final score. The team teed off at 1pm in much fairer weather conditions for the afternoon singles. Rosie Youngman was first off and led the team in a yo-yo game, which unfortunately ended up with a point to Buckinghamshire. Second up was Carol Gibbs, who had a close tough battle but birdies from bucks on 16 and 17 led to an unfortunate 2&1 defeat. Alex Banham fought a battle of birdies, with lots of good golf played but due to an unlucky lie in a wet bunker on 16 ended up losing on the 18th. Ellie Darnell played an up and down game with her opponent, lots of birdies with steady golf however again just lost on the 17 th with a 2/1 defeat. The penultimate single was Becky MacLaren, who was playing her very first County debut. It was a very close match but Bucks birdies on 12 and 13 didn’t help Becky’s cause who unfortunately lost. The final single Charlotte Taylor who after being 3 down after 9 managed to fight back and ended up with a 1 up victory to put the first point for Northamptonshire on the board. Good luck to all our ladies!